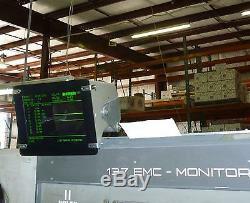 BRAND NEW LCD MONITOR OUTFITS POLAR 96, 115 & 137 EMC PAPER CUTTERS. IN MOST CASES CAN BE MOUNTED RIGHT INTO THE EXISTING MONITOR ORIGINAL HOUSING. Active Screen Size: 10.1 inches diagonal. Outline Dimension: 235.0(H) 143.0(V) 5.2(D)[mm]. Pixel Pitch: 0.2175mmx0.2088mm. Color Depth: 6-bit, 262,144 colors. Power Consumption Total: 2.6 WattTyp. , B/L input 1.8 WattTyp. Display Operating Mode: Transmissive mode, normally white. Power supply: DC 12V, 2A. LCD driver board ------------- 1pc. Gross weight including conversion device and cables: 2.5kg. The item "LCD MONITORS FOR 96,115 & 137 POLAR EMC PAPER CUTTERS" is in sale since Thursday, August 13, 2015. This item is in the category "Business & Industrial\Printing & Graphic Arts\Bindery & Finishing Equipment\Paper Drills & Punches". The seller is "onmetro" and is located in Mississauga, Ontario.